You know how sometimes you’re in the mood for a totally comforting treat that doesn’t need a ton of ingredients? That was me the other day :) There’s a few things that come straight to mind when I think comfort food, and two of them are: peanut butter + chocolate. This trusty combo never disappoints. 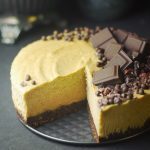 So my thinking with this simple, comforting cake was to basically take some creamy dreamy peanut butter cheesecake-like filling and put it together with an amazing, two-second, no-bake brownie crust. 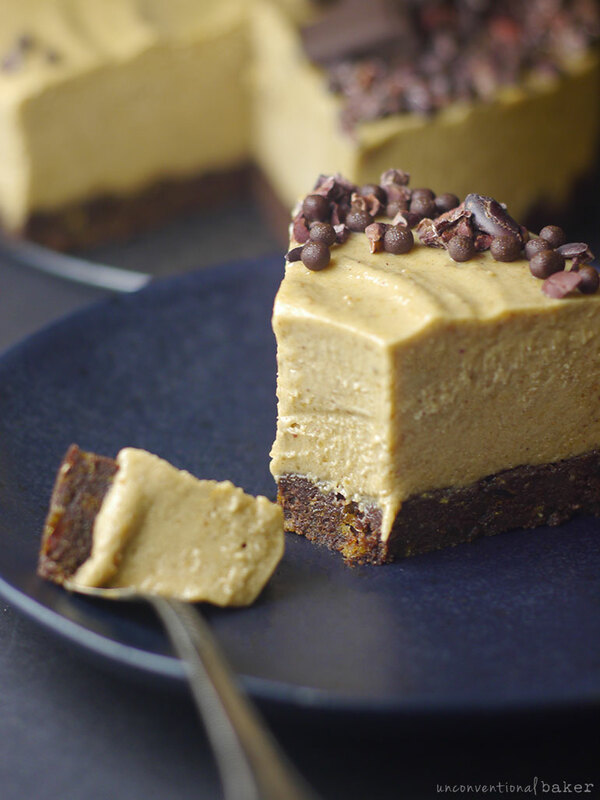 Yep, peanut butter + brownies + a super easy recipe is all you need for a total win! Another thing this cake has going for it is that it’s made without a blender. If you have a good blender, that might not seem like much of a big deal — that is, until it comes time to wash the dishes, then you’ll thank me for the one less dish you have to wash ;). 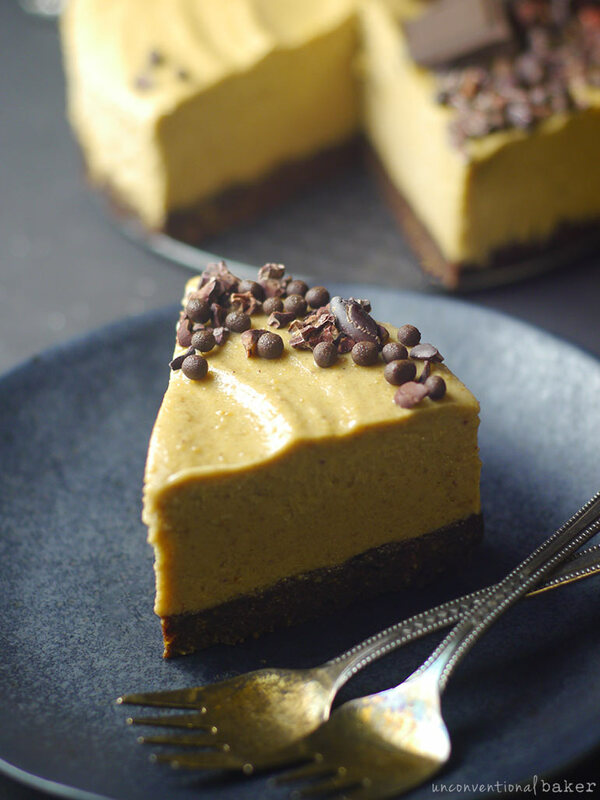 But seriously, it’s a great cake to try out if you only have a food processor and not a good blender (since many raw/ no-bake cakes turn out much much better with a high-power blender). 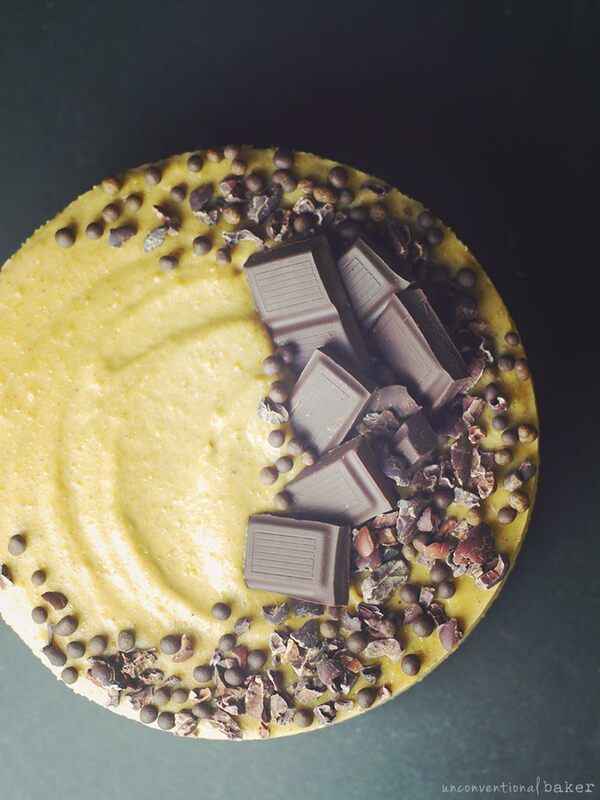 As an added bonus, this cake is cashew-free and made with no added oils…Oh and no coconut too! The one thing that is does have is bananas — if you’re in the no bananas camp, maybe try this peanut butter ice cream instead (one of my faves!). 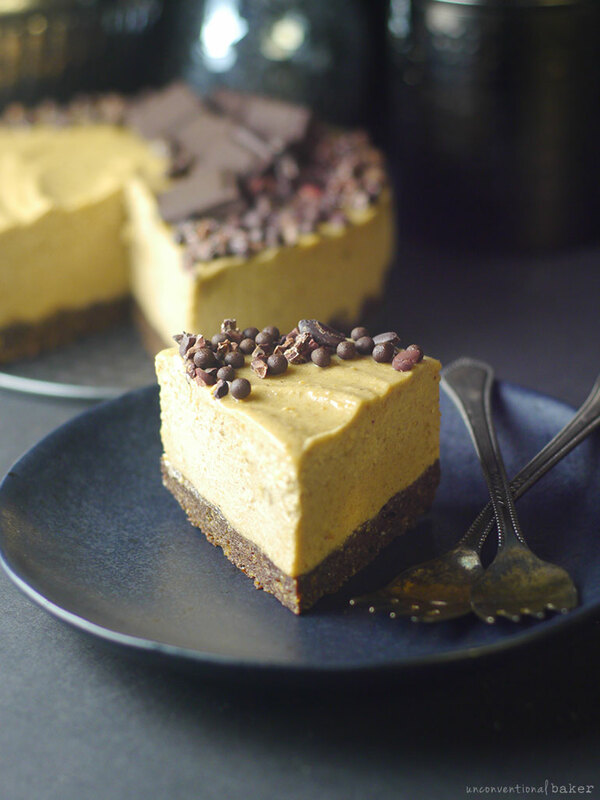 A delicious pairing of creamy vegan peanut butter cheesecake with a rich gluten-free (and grain-free) chocolate crust. Oil-free & cashew-free. Process all crust ingredients in a food processor until the mixture is combined and starts to form into a ball. Transfer to a 6″ springform pan and press down into a flat even crust along the bottom. Freeze while working on next step. Wipe out the processor to remove any remaining residues from the crust. Add all filling ingredients to the processor and process into a smooth creamy texture. Transfer this mixture into the springform pan over the crust. Tap the pan on the counter a few times (to release air bubbles) and smooth out the top of the cake with the back of a spoon. Decorate with desired toppings. *Storage notes: treat this cake as you would ice cream. If left at room temperature it will begin to slowly melt as it thaws, so best to keep it frozen until serving time and give it a light thawing on the counter as needed (5-10 mins, until it slices easily). Disclaimer: this recipe contains affiliate links to the products used to make the recipe. Hi Elizabeth. Bananas work well here because of their sweetness, moisture, and creaminess, though their flavor in the cake is not prominent. Another creamy fruit you can try as a substitute is mango or even a ripe persimmon, though these will add their own taste to the cake. You can also play around with omitting the bananas / fruit, and instead adding an extra 1/2 cup peanut butter, adding 2 extra tbsp of maple syrup, and 1/2 cup almond milk or water. It’ll change the cake some, but should still be delicious. This method is totally hypothetical on my part — if you give it a try, would love to hear how you go. I ran out of maple syrup, so mine was made with 1/4 cup maple syrup and 1/4 cup simple coconut sugar syrup. I also used the Plain Jane peanut butter from the Saratoga Peanut Butter Company (the only brand I buy- every flavor is amazing!!). At first I was nervous about using a salted peanut butter since the recipe calls for salt, but the pie was still so sweet! Sounds delish, Audrey! Sometimes you just can’t beat the chocolate pb combo! 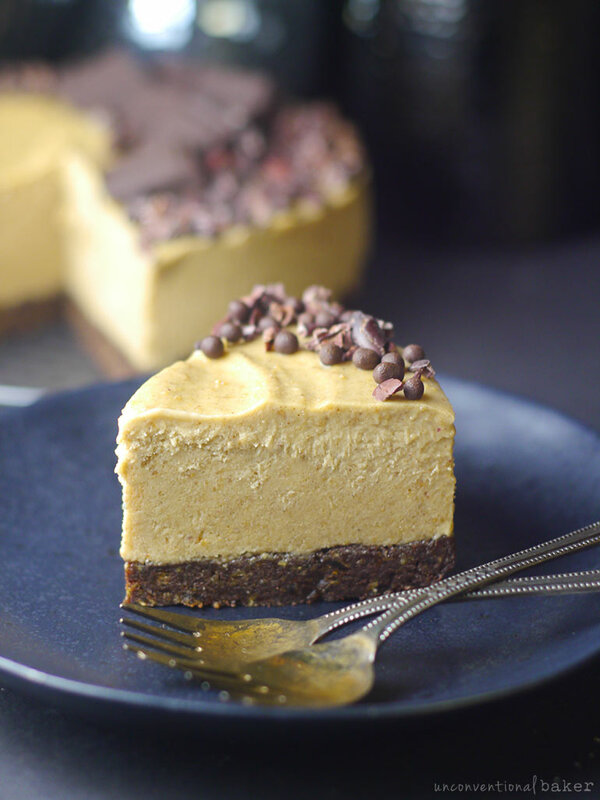 You call this the Holy Grail of desserts and I certainly would lead a crusade to my refrigerator for another slice of this chocolatey, peanut butter, banana confection. 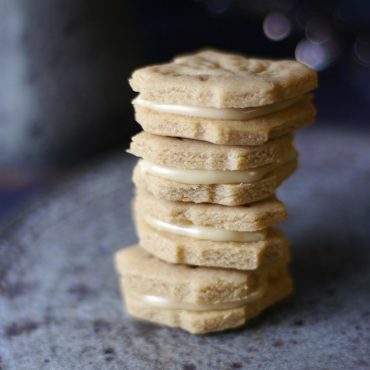 Can I use another nut/seed butter for this recipe? Hi Pamela, yes, definitely. 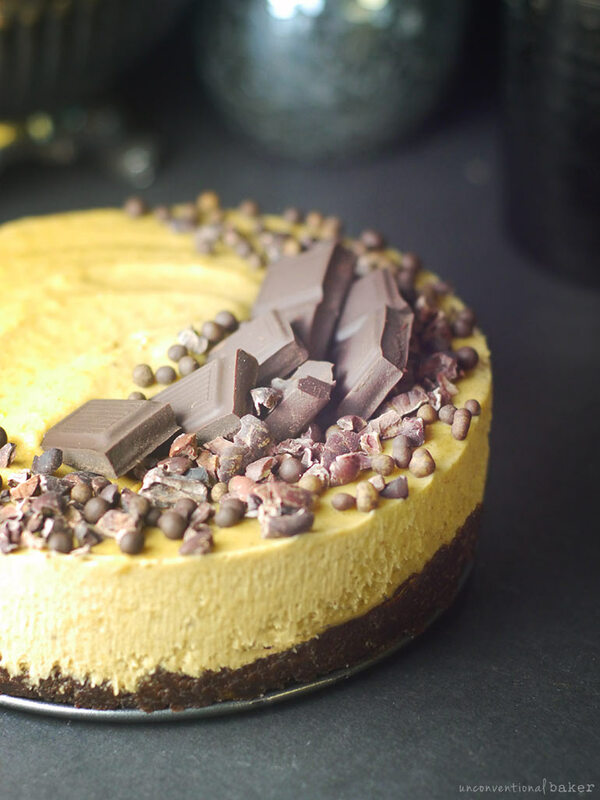 This would be amazing with hazelnut butter or almond or pecan. 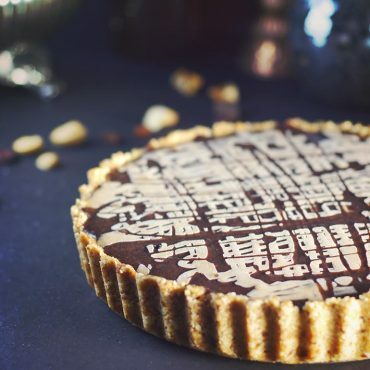 What about using peanut flour or PB2 instead of almonds in the crust? That’s what I’ll do tonight! Hi Catherine, how did it go with the PB2 for you? 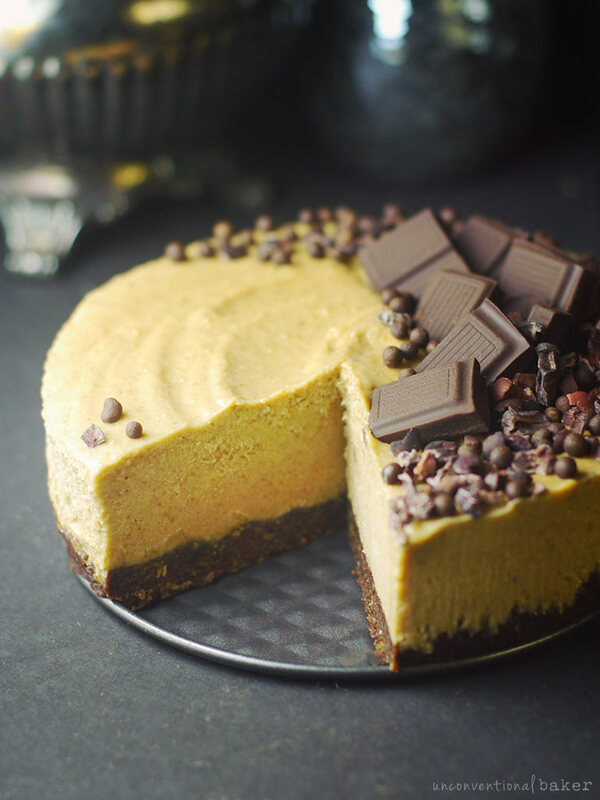 Peanut butter and brownies in a no-bake cake? Now that’s MY kind of cake! :D This looks to die for. I love the dark chocolate squares on top! this sounds incredible … and … for those of us who cannot any longer use peanuts, is it possible to substitute other nut butters (such as almond, for example)? Hi Janet, absolutely. I think this would be amazing with hazelnut butter, almond or pecan.